A while back when I was a bit younger, I remember wading through streams and catching crayfish. This was always a fun activity for my brothers and I (and hey, this might have even started my addiction to crustaceans!). Anyway, we kept a few of those crayfish and went to the library to see what they liked to eat. 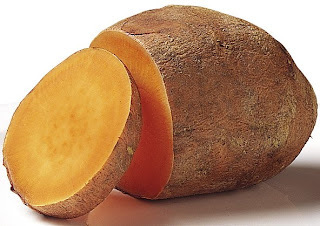 One of the recommended foods was sweet potato (or yams, whatever you want to call them), along with other protein sources. I've pretty much figured that land hermit crabs and crayfish would enjoy the same foods, so I have finally decided to give them some fresh sweet potato! The crayfish used to love it and eat it all, so I am sure the crabs are bound to love it. The sweet potato is full of beta-carotene, so that means a lot of vitamin A for the crabs tonight. It is also a great enhancer in color. Just in case they like it and if the United States goes on a yam famine, I have some extra stored up in the freezer along with some other fruit.